Just like grandma used to make! 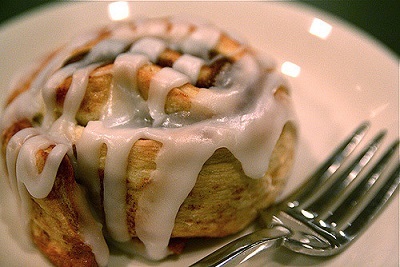 Everyone loves a classic cinnamon bun to take them back to their childhood. Warm, gooey, just the right amount of sweetness – they really have it all. This version is topped with cream cheese icing to add a layer of creamy indulgence. Measure in the active yeast to the warm milk and let sit for 10 minutes until you see bubbles. In a large mixing bowl, add in the flour, sugar, salt, softened butter, eggs and milk. Mix until everything is combined and let the dough sit for 5 minutes. Knead the dough on a lightly floured counter top for 10-15 minutes until the dough is no longer sticky. Once ready, put the dough back in the bowl, cover with a cloth and let sit for at least an hour and a half or until it’s doubled in size. While you wait for the dough to rise you can make the icing and prep the filling. In a medium sized glass bowl, soften the cream cheese in the microwave. Mix gently until there are no more lumps. Add in the softened butter and mix until combined. Add in the milk and vanilla and continue to mix. Slowly add in the icing sugar, until desired sweetness is achieved. Mix the cinnamon and sugar together and set aside. Butter a 9×13 baking pan and set aside. Preheat oven to 350F. Once the dough has risen place some flour on the counter top and roll out the dough into a rectangle roughly 5cm thick. Spread the softened butter over the entire rectangle. Sprinkle on the cinnamon sugar mixture. 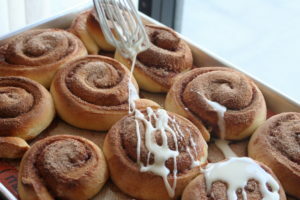 Roll the dough from the long edge over, and then cut the cinnamon log into 12 equal pieces and place in the baking pan. Cover and let rest for 20-30 minutes or until the buns have nearly doubled in size. Bake for 25-30 mins or until the tops are starting to brown. Spread the frosting on the rolls when they’re still warm to allow the icing to melt into all the crevices. Save the extra icing for later when you’re ready to eat them. Recipe makes 12 large cinnamon buns. Before adding your yeast, make sure the milk isn’t too hot or it will denature the yeast and your dough will not rise! Don’t use too much flour on the counter top or the dough will dry out!